Building lists is relaxing to me – I can lay on the couch while my daughter and wife nap and plink away on my iPhone or iPad and theorycraft in my head all the imaginary battles that exist there. Typically, I’ll just plot out my existing force of models and fiddle with wargear options and speculate on the scenarios they may find themselves in during a game. Do my assault squad marines get a flamer and should I give the sergeant a combi-flamer? They’d do well against my usual Tyranid and Ork opponents.. but do they keep the jump packs? Maybe put them in a Rhino or Drop Pod? It’s this kind of idle thought that I’ll usually spend staring blankly at the screen trying to imagine just exactly what will be most effective. But it’s not just maximizing effect – it’s also maintaining a certain level of “fluff” in my lists that I am satisfied with my usually highly thematic forces. I never take Grav Cannons, for example, despite their overwhelming popularity and power in the meta. They just don’t “feel right” to me. Perhaps I could see them in an AdMech force, or maybe Iron Hands or some other technologically minded Force. 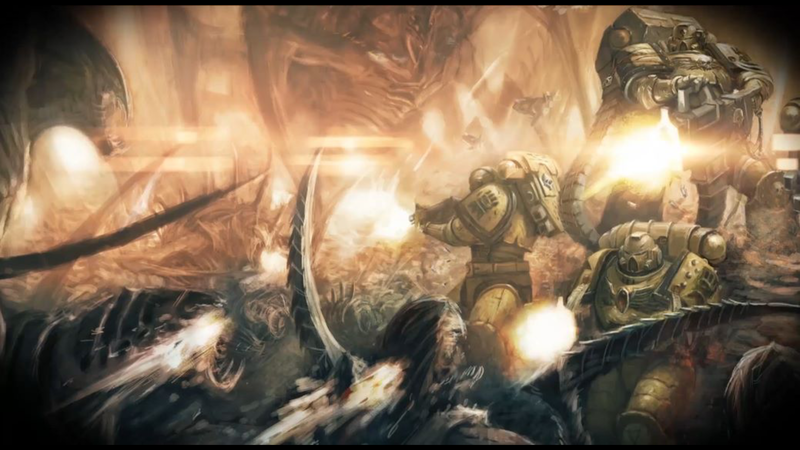 To me, Space Marines are what they have been since I first played them in the 90’s: bolters, flamers, missiles, plasma, and even lascannon. Grav weapons, to me, feel very Orky. I just never understood why they introduced Grav into the lists, and as a result: I’ll never choose it! Of course I know this is silly, that I’m handicapping myself – but it’s what makes the game challenging to me. Playing semi-competitively while restricting my own options based on my perceptions of fluff is a very interesting challenge. But here I am rambling away when I should be hammering out my list! I’m up to 3,500 points of Imperial Fists on-hand (pun intended), with plans for an additional Land Raider and at least one Vindicator. In the end I’ll have a massive 4,000 point full strength 5th Company of Imperial Fists. I’ll post the actual list here when I get some more time. I totally play this way too, I have no interest in having Grav weapons in my blood angels army. It was introduced badly and doesn’t feel right. I will never pick it and I am alright with that. I know, right?! With 8th Edition, I’m most excited about the fact that Grav isn’t king anymore. My Heavy Bolter devastators squad is actually worthwhile!